Ready to bring your new furball home? Great! Just make sure you know some of the basics of hamster care first. Sometimes your house or apartment just isn’t big enough for a dog, and you’re allergic to cats but really want a furry pet to love. A hamster might fit the bill for you. Before you run out and pick out your perfect hamster, take a look at some things they wish you knew. Hamsters are omnivores. They enjoy a meaty snack occasionally along with their nuts and berries. Don’t worry — you won’t have to drop a chicken leg in their cage, but your hamster will enjoy a tasty cricket now and again. Most hamster feeds are formulated to meet a hamster’s dietary requirements, so if bugs gross you out, you’re still covered. Hamsters do not have strong suction skills. When you’re buying a water bottle for their cage, make sure it’s relatively easy for them to draw from. Traditional ball valve sipper tubes can challenge a hamster’s ability to pull out enough water. A water bottle with a pinch in the tube is the better choice. Know which foods you can feed your hamster in addition to pellets, and which ones you can’t. Certain foods, even fruits, can be toxic. For example, your hamster will enjoy the occasional piece of washed apple, but he cannot have the seeds — they will make him sick. Even approved foods, such as apples and lettuces, should be given only sparingly: every 2–3 days at most. 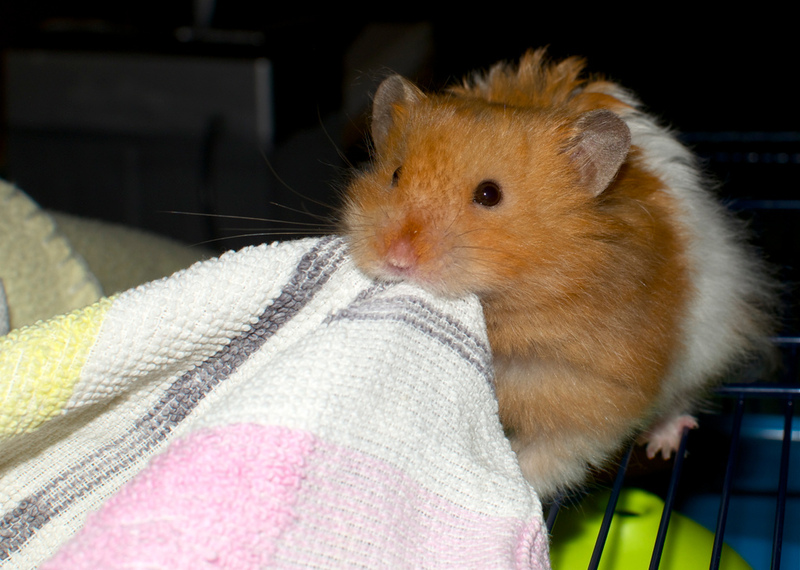 Your hamster probably doesn’t want me to tell you this, but he’s a hoarder at heart. It’s cute when your hamster stuffs his cheeks with food, but beware. He’s not eating it all — he’s going to stash some of it for a midnight snack. Don’t give your hamster more food than he needs. Food can get moldy or spoil, so be diligent about clearing out his hoards. Hamsters have been known to nip people occasionally. They do this not out of malice, but because they get scared. Handle your hamster gently, and if he starts to shake or nip, it’s time to put him down to let him recover. As he gets used to you, he will become more comfortable, and you can then hold him for a longer time. The ASPCA recommends that hamsters not be handled by kids younger than 6 and that older children be supervised when handling hamsters to avoid accidental nipping and dropping. Your hamster’s teeth don’t stop growing. He needs your help to keep them at the proper size. Don’t worry, it’s easy. He does all the work. Provide him with something hard to gnaw on: a block of wood, a twig or even a dog biscuit will help him keep those teeth under control. If you do provide wood or a twig, make sure it hasn’t been treated with pesticides, paints, stains or other toxic materials. Hamsters are susceptible to respiratory illness, including the common cold. If you’re sick, try not to handle your hamster. Wash your hands thoroughly before touching his water or food supplies. If you suspect your hamster is sick, call your veterinarian. Your hamster needs you to clean out his cage every day. Remove droppings, replace soiled bedding and try to find all his hoarded food. Once a week, remove and discard all the shavings; wash the cage with warm, soapy water; and lay fresh shavings down for bedding. Your hamster needs (and loves) exercise, so be sure to provide a solid wheel to run on. Without exercise, your hamster may get chunky. 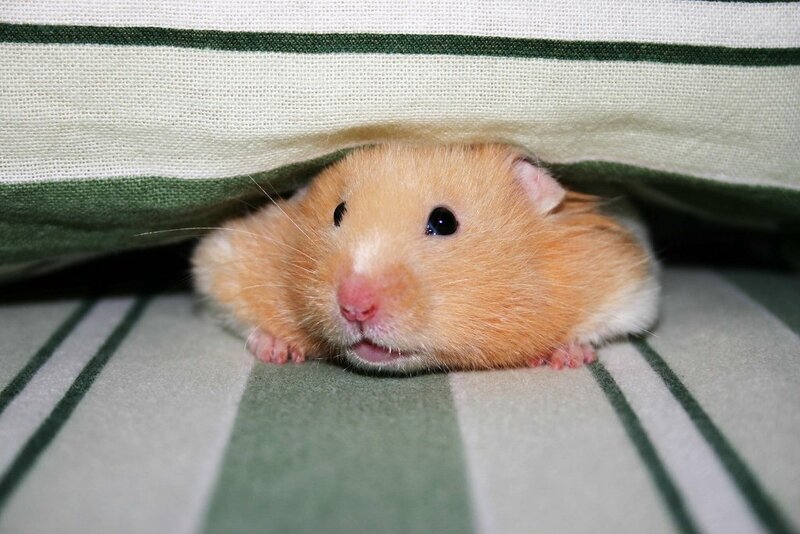 Stay away from wheels that have spokes or gaps; your hamster can get his feet caught in them. Hamster Club: What Should I Feed My Hammy?